The Tradition & Nostalgia of "Old Nags Head" still exists in Historic Cottages such as this one. A Comfortable, Lovingly Cared for Home & it Shows! 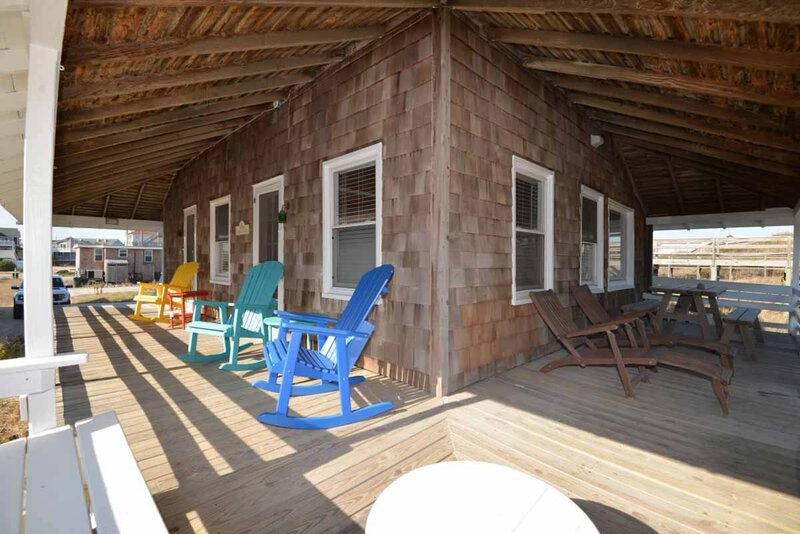 The Wrap Around Covered Porch provides a Gathering Spot to Enjoy the Ocean Breezes & Rock the Night Away. Perfect for Families seeking an Affordable Oceanfront Vacation where the Beach & its History are important factors. The Way We Were - A is a Very Special Vacation home w/a Story to Tell. Need one more room? Check out our two bedroom cottage The Way We Were-B, #634 located next door. Ground Level: Parking for 3 Cars, Enclosed Outside Shower, Steps to Entry, Large Dune Top Deck w/ Seating, Steps to the Beach & Awesome Ocean Views. Mid Level: Living/Dining/Kitchen Area, TV, DVD, Full Bath w/Shower Only, Laundry Area, Covered Porch w/Furniture, Outside Shower & Private Entrance to Separate Bedroom w/Double, Window AC, TV & Half Bath. Top Level: 3 Bedrooms (2 w/Queens, & TV, & 1 w/2 Singles), Full Bath & Ocean Views. Features include: C/AC & Heat, Washer/Dryer, Dishwasher, 4 TVs, DVD, Stereo, Wireless Internet, Baby Equipment (Pac-n-Play). Located Next to #634. One Mature Dog Allowed w/Fee. This is a Non-Smoking Unit. FOR 2019 - One Dog Allowed w/Fee & will be Non-Smoking. I have rented from joe lamb for several years and have always been more than happy with their service. I enjoy the small , older cottages and this one provides more space than expected. The large deck is awesome. Great home with lots of windows and a beautiful cross breeze. I love the keyless entry and not needing to stop to check in at a main office. This is a very nice old beach house. We totally love this house! It's just a nice old, homey Beach House. We like it. We loved that the outdoor shower had hot water so that we could use that for a "real" shower and not just a beach rinse off. The house was cozy and had cute decor. We also loved the seats on the upper and lower decks. A very comfortable cottage. Love the side porch and the Dune Deck. Loved the old style cottage feel of the property! Loved the upper deck!! 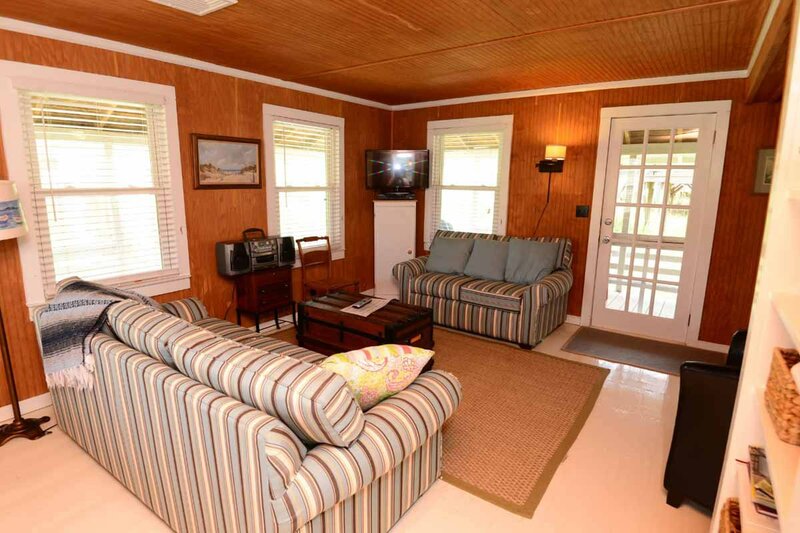 Great house and location for a classic beach vacation! Loved the shade on the porch! Location is great. Enjoyed the decks. Layout is quirky and fun. We wanted an old fashioned beach house and that is what we got - loved the wood floors, wrap-around deck and awesome, awesome trek rocking chairs - so very comfortable.